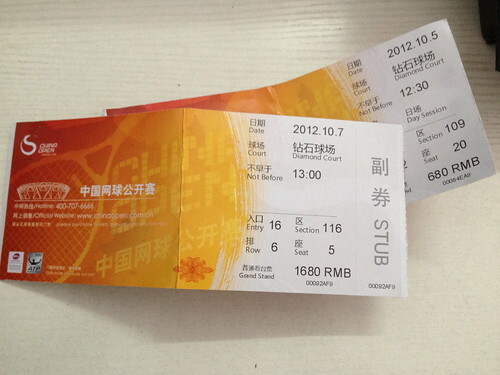 I "ate snake" from work to go catch the Beijing Tennis Open 2012. I initially went to their website to try to book the tickets online by it was all sold out to my dismay. Undeterred, I decided to still go and try my luck at the gate. Strange thing as I was walking towards the ticket booth, I was greeted with many touts who were not trying to sell me tickets but instead, trying to buy from me. As I later figured out, they were looking for day passes and were hoping that you decided to leave the stadium prematurely and hence there is still value for these tickets i.e. still have a game or two more to watch. They will buy the tickets and then offer them to the next person at a lower price than the original ticket price (since a game of two has already lapsed), with their cut included, of course. 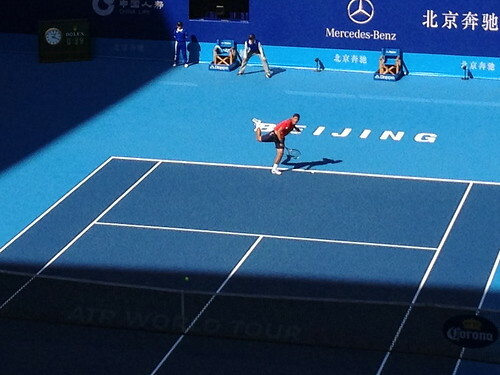 The first game of the day was local boy qualifier Zhang Ze (ATP Rank: 165) doing his fairy tale run against Germany's Florian Mayer (ATP Rank: 29). It is one thing to be cheering for a good winner or a great shot but it is another thing to be cheering at Zhang's mistakes or double faults. Could see everybody staring daggers at him. I scared the fella later kena hantam. Haha. This family in front of me damn cute. 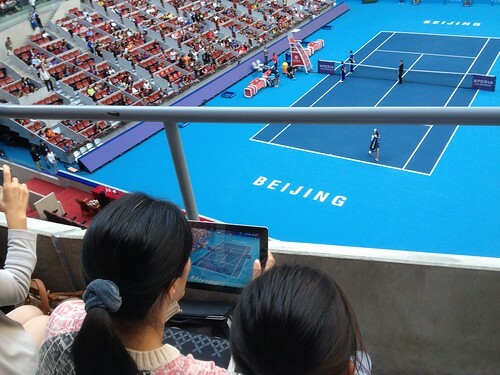 The mother was hogging the iPad and video taping the match. Pirate Alert!! Anyway, I took a shot of them taking a shot of the match. Tennisception! But the cutest part is the father super kancheong whenever there is a changeover i.e. a 2-minute break for the players. During this time, the cameras will zoom in on a random section of fans that will be displayed on the Jumbotron above. Hate to break it to them but the camera only capture those in the VIP seats. The Sharapova-Kerber game was up next and I tell you, Sharapova is damn chio in real life. Damn those widescreen TVs for not giving her slender *drool* legs enough credit. Looking at Sharapova's ground strokes, she was definitely the harder hitter than Kerber. I dare say even stronger than Mayer and Zhang. 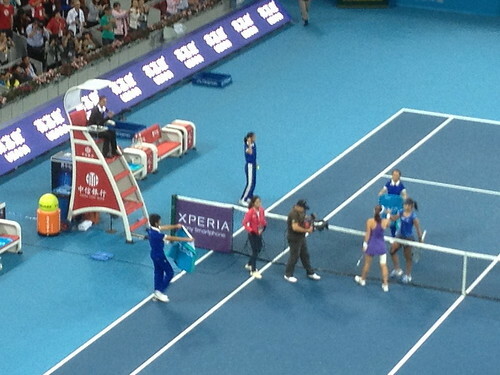 Hence, this game was even more entertaining than the Mayer-Zhang game earlier. 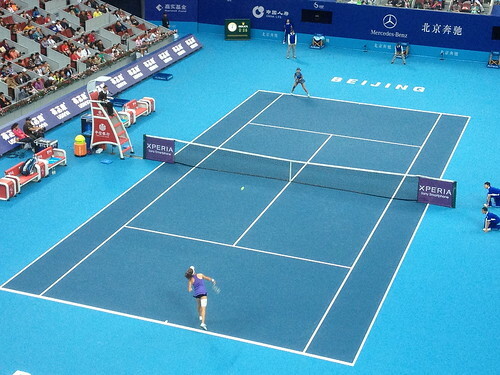 Sharapova whitewashed Kerber 6-0 in the first set. Ouch. This other cute little girl sitting next to me was telling her mother, "Mommy! Mommy! 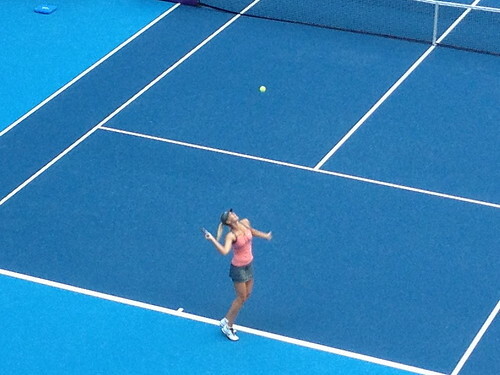 Sharapova is winning!" "Why do you say so?" asked the mother. "Coz Sharapova got 62 points and Kerber got 0! ", replied the girl smugly. Aiyoh!! So cute lah!! But at the same time damn facepalm. Anyway, Kerber retired after trailing 0-3 in the second set. I think Kerber had some kind of injury prior to the match which explained the lopsided score. Some spectators were booing at the premature ending of the game which I felt is not right. To me, I think it was the right thing to do as any risk may jeopardise the chance to play in the WTA Championships in Istanbul at the end of October 2012 which obviously holds a much bigger purse. The last match of the daytime schedule was perhaps the match that all the locals were waiting for. Li Na played Agnieszka Radwanska. 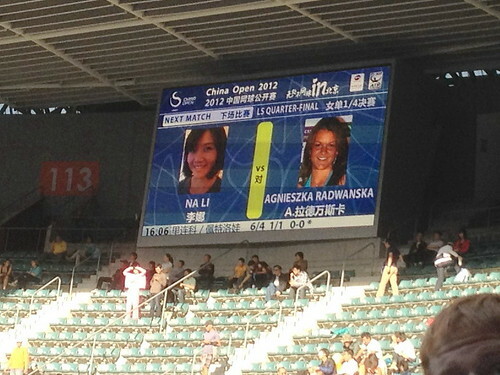 I did a double take when I saw Li Na's photo on the Jumbotron. Well, either that or some idiot uploaded the wrong photo of a whole different person. Li Na played better than last round as she was more patient biding her time on the court and not rushing to try for winners. That was the mistake that she made during the last game making lots of errors and gifting points to her opponent extravagantly. 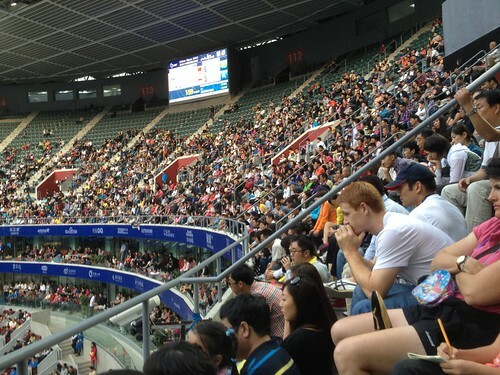 The crowd ROARED as Li Na closed the first set 6-4 after a grueling 56 minutes. Got the whole stadium on their feet...... to go toilet. Game, Set and Match. Li Na. 6-4, 6-2 as the crowd cheered as home girl is through to the semi-finals! Congrats to Li Na as the points from the quarter-final win consolidated her place in the WTA Championships where only the top 8 players qualify. 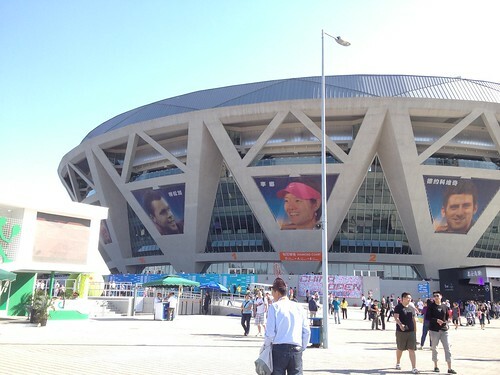 And as you would have guessed it, Li Na was ranked No. 8 coming into this tournament and is confirmed to remained as No. 8 this month.